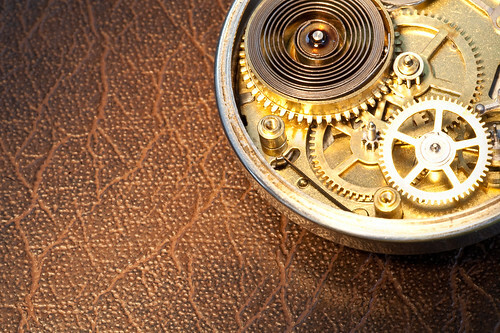 This entry was posted in Photos and tagged "canon ef 100mm f/2.8 macro usm", 52 week challenge, analog, antique, back, background, canon EOS 5D, circle, clock, clockwork, cogs, creative tabletop photography, gears, gold, guts, image, inner workings, inside, insides, intricate, leather, lighting, loren zemlicka, mechanical, mechanism, Metal, movement, old, old fashioned, open, photo, photo challenge, photography, picture, pocket watch, round, shiny, spring, still life, stock photography, texture, time, timepiece, wallpaper, watch, weekly photo challenge by lorenzemlicka. Bookmark the permalink. This is a wonderful composition! I’ve always loved the inside of watches. I took my grandfather’s apart once, it looked kind of like this one. I was 6. He was not very happy.